Today we continue to celebrate the Feast of the Presentation of the Lord in the Temple, when the Theotokos and St. Joseph the Betrothed took the forty-day old Savior to the Temple in obedience to the requirements of the Old Testament law. This is a feast in which we celebrate how the Child born at Christmas has fulfilled the hopes of the children of Abraham and extended them to all people with faith in Him. Righteous Simeon held Christ in his arms and proclaimed, “Lord, now let your servant depart in peace, according to your word; for my eyes have seen your salvation which you have prepared in the presence of all peoples, a light for revelation to the Gentiles, and for glory to your people Israel.” The elderly Prophetess Anna also “spoke of him to all who were looking for the redemption of Jerusalem.” The Old Testament temple and priesthood were preparatory signs of the coming of the Great High Priest Who offers Himself for the salvation of the world. He has fulfilled the law and the calling of every human person to become like God in holiness, for He has joined humanity to divinity in Himself as the God-Man. In order to celebrate this feast properly, we must go beyond speaking words about what Christ has done, as true as those words are. We must present and unite ourselves to Him personally, making every dimension of our life an entrance into the heavenly worship of the Kingdom. For our Savior is the One “Who sat down at the right hand of the throne of the Majesty in heaven, and Who serves in the sanctuary, the true tabernacle set up by the Lord, not by a mere human being.” (Heb. 8:1-2) Everything that we think, say, and do in this world may participate already in heavenly glory through Christ, when we unite ourselves to Him in holiness. In order for that to happen, we must obey St. Paul’s instruction: “We entreat you not to accept the grace of God in vain…Behold, now is the acceptable time; behold, now is the day of salvation.” If we are not offering ourselves to the Lord today, then we are refusing the only opportunity we have to share more fully in His life. The past is gone and we have no idea what the future will hold. We must be good stewards of the opportunities available to us right now, if we want to find the healing of our souls. As the parable in today’s gospel reading makes clear, we must invest ourselves more fully in the life of Christ. The point is not what particular challenges and opportunities we have on a daily basis, but whether we are responding to them in a way that serves God’s purposes for us, our neighbors, and our world. The servants who invested their talents such that they produced more were exalted. The servant who, out of fear, buried his talent in the ground and produced nothing lost what he had and was cast out. The point was not how much they began with, but what they did with what they had. Regardless of the circumstances of our lives, we all face the same challenge to enter more fully into the blessed life of the Kingdom. “Now is the day of salvation” for us all because the ultimate question is whether we are uniting ourselves to Christ in the present reality of our lives. If we are doing so, then we are becoming more fully the people God created us to be in His image and likeness through the eternal ministry of our Great High Priest. If we are not, we are refusing to cooperate with our Lord’s gracious invitation to share in the life of the Kingdom. That is a path that leads only to greater spiritual weakness. In the parable, the man with one talent hid it in the ground because he was afraid of his master. Notice that the master said that the servant, at the very least, could have put the talent in a bank and produced a little bit of interest for him. We may be tempted to refuse to give our time, energy, and abilities to serve Christ because we are afraid that He will not accept our offering. We may think that we will fail at what we have set out to do or perhaps somehow look foolish in the eyes of others. We may feel weak or guilty or otherwise believe that opening some area of our lives to the Savior will result only in harsh condemnation. Remember, however, that the master in the parable would have accepted even a small amount of interest from one talent put in the bank. He told the unfortunate servant that the proper response to his fear was at least to do something productive, not to be paralyzed by anxiety or shame. On the one hand, it could be understandable why we would hesitate to unite ourselves to the Lord. It can be painful and embarrassing to acknowledge the truth about our own brokenness and need for healing. Since God is infinitely holy and we most surely are not, the temptation not to expose ourselves to Him is powerful. We like to think that it would be better to avoid the pain of condemnation, failure, or hurt pride by keeping the Lord—and a recognition of the truth about our lives– at arm’s length. Consequently, we bury our talent in the ground as we refuse to offer and open ourselves to Christ. The problem, of course, is that the assumptions driving the fears that keep us from being good stewards of our talents have no basis in reality. The Master Who calls us to offer our lives to Him is Jesus Christ, Who endured crucifixion, death, burial, and descent into Hades for our salvation. Purely out of love for us, He offered up Himself in order to conquer the grave in His glorious resurrection on the third day. In His earthly ministry, the Savior had mercy on every repentant sinner who came to Him, including St. Peter who denied Him three times before His crucifixion. He healed diseases of all kinds, cast out demons, and even raised the dead. There is no reason to let fear of rejection deter us from humbly offering ourselves to Him for the service of the Kingdom. If we wonder what it would mean for us to be good stewards of our talents, all that we need to do is look around us. 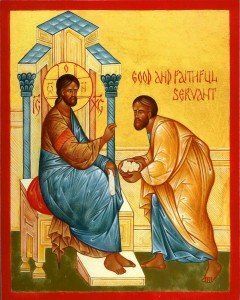 Christ said that He “came to serve, not to be served” (Matt. 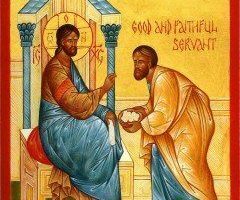 20:28) and there is no shortage of ways to serve Him in our parish, in our families, and in our neighbors, friends, and acquaintances. To the extent that we help even the lowliest person, we serve our Lord. We must also be good stewards by devoting our time, energy, and attention to prayer, reading the Bible, studying the lives and teachings of the saints, and gaining strength in resisting our self-centered desires by fasting and other forms of self-denial. We must deliberately invest ourselves in daily practices that enable us to offer ourselves to Christ. If we do not, our focus will remain simply on ourselves, and especially on fulfilling our passions in ways that further enslave us to them. At the end of the day, we must offer ourselves to something or someone. Remembering how Christ has fulfilled the ancient prophecies of the Old Testament, let us unite ourselves to Him as our Great High Priest by making each moment of our lives a point of entrance into the eternal liturgy of the Kingdom of Heaven. Righteous Simeon and the Prophetess Anna waited decades for the Messiah. Since He has already come, let us give our whole lives to Him. That is the only way to be good stewards of our gifts as we refuse “to accept the grace of God in vain,” but instead do all that we can to cooperate with Him for the healing of our souls. Anything less amounts to burying our talents in the ground and refusing to invest ourselves in the service of the Kingdom. I always look forward to your next homily. Thanks for all your work on behalf of His flock. Thanks so much for your kind and encouraging message. I am glad that the postings are of use.